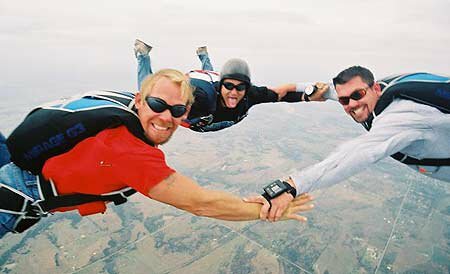 After a four to six hour ground school lesson, you can take to the sky for your first solo skydive or try a tandem skydive at Oklahoma Skydiving Center in Cushing. The town of Cushing got its start rooted in a rich Native American history as part of the Sac & Fox Indian Reservation, while nearby Yale fell on Pawnee Reservation land. In the early 1900s, rail lines came to nearby Perkins before spreading to Yale and Cushing. This connection between cities helped Cushing reach its peak as the Pipeline Crossroads of the World. Today, you can learn more about Payne County’s fascinating history while living and eating well at a number of excellent stops along the way. Payne County’s history as Indian Territory started with a Civil War battle. Attend the Battle of Round Mountain Re-enactment in Yale for a glimpse into this very battle, the first of its kind in Indian Territory. Then, celebrate Payne County’s Native American legacy with a trip to the annual Native Fest in Cushing. At this one-day event, listen to storytellers and witness traditional drumming and dancing. At the annual Iowa Tribal Powwow in Perkins, guests can learn about traditional camping, arts and gourd dancing. Continue in true Western tradition, and head to the annual Cushing Community PRCA Rodeo to experience its wide variety of bull riding, calf roping and barrel racing events. Get a taste of Cushing’s cowboy days with a trip to the Homestead Restaurant for dinner, sampling home-style southern cooking perfected since its 1953 opening date. Choose between all-day breakfast items, or munch on an Indian taco served with chips and salsa. Its sister restaurant, the Steer Inn Family Restaurant, also offers hearty daily specials, from the New York strip steak and sweet pepper bacon cheddar brisket sandwich to the bomb burrito and Frito chili pie. Continue in true Western tradition, and head to the annual Cushing Community PRCA Rodeo to experience its wide variety of bull riding, calf roping and barrel racing events. Over in Perkins, Oklahoma State University fans can tour the Frank Eaton Home to get a sense of the man who inspired the “Pistol Pete” cowboy mascot. After landing in nearby Perkins in 1900, the Eastern Oklahoma Railway line descended upon Cushing in 1902, bridging the two towns and Olympian Jim Thorpe’s hometown, Yale, together. After stopping by the Jim Thorpe Home in Yale, railroad enthusiasts can explore the Downtown Cushing Centennial Park to spot a restored drover train car, a nod to the railroad’s influence on the town. Next, venture over to Perkins to see original pieces of the Cushing MK&T Railroad at the Cimarron Valley Railroad Museum in the Oklahoma Territorial Plaza. Once the MK&T line followed suit, new inhabitants looking for oil opportunities at newly discovered gusher sites had easier access to Yale and Cushing. From 1912-1915, the population of these two towns surged. Although town refineries have since closed, modern-day attractions continue drawing in visitors. The Oklahoma Skydiving Center offers thrill seekers an adrenaline rush, while family-friendly places like Cushing Aquatic Center, Frontier Bowl, Iowa Tribe’s Grey Snow Eagle House and Jim Thorpe Park are perfect for the kids. Adults are sure to enjoy Cushing Community Theatre performances and Mediterranean bites at Naifeh’s Deli & Grill. Whether discovering snapshots of the past or exploring contemporary activities, guests are sure to have a blast touring through Payne County.